Many people from Central America are seeking asylum at the US-Mexico border, but what is asylum, what are the legal aspects of this immigration status? To talk about this we are joined by Holly S. Cooper, Co-director of the Immigration Law Clinic at the University of California, Davis. She has extensive litigation experience defending the rights of immigrants and is a nationally recognized expert on immigration detention issues and on the immigration consequences of criminal convictions. Then, a conversation with former Wall Stree insider Nomi Prins to talk about how the 2007-2008 financial crisis turbo-boosted the influence of central bankers and triggered a massive shift in the world order. 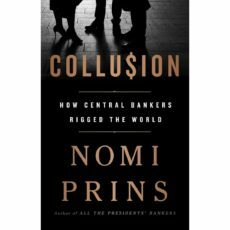 Noomi Prins is the author of the new book Collusion How Central Bankers Rigged the World. former Wall Street.